Yeo’s job status was a nearly annual topic of discussion during his four-plus seasons as Minnesota’s head coach. *The Wild is in the midst of one of the strangest seven-game road trips I’ve ever seen — one that will take Minnesota to St. Louis on two separate occasions while the other five games are out west. The first of those jaunts to St. Louis comes Saturday, where the surging Wild will face a Blues team with a lot of early-season questions. The biggest of those questions might be this: How long will Mike Yeo be the head coach? That should be a familiar question to Wild fans, since Yeo’s job status was a nearly annual topic of discussion during his four full seasons (and the fifth in which he was actually fired midyear) as Minnesota’s head coach. 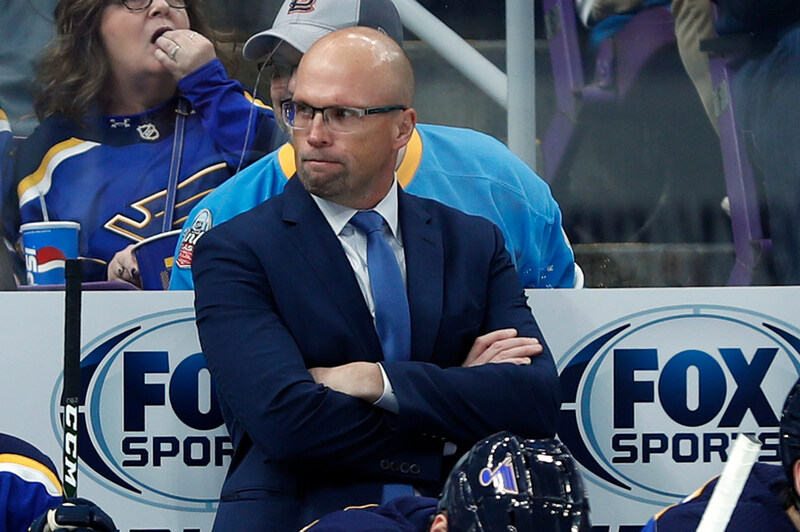 Yeo took over the Blues in the middle of the 2016-17 season, guiding them to a 22-8-2 record and a first-round playoff upset of the Wild (one that also is familiar in a couple regards, since Yeo pulled a couple of first-round upsets when he was Wild coach … and conversely Wild fans are also used to playoff disappointment). The Blues entered last season with lofty expectations, but they missed the playoffs in the crowded Western Conference — where their 94 points weren’t enough to get in. St. Louis added a bunch of talent this offseason, but after a 2-4-3 start the Yeo rumblings started up. St. Louis had a closed-door meeting after that game and has won two in a row since — scoring 12 goals in the process — to slow down the Yeo rumors. We’ll see if the Wild can spark things up again with a win on Saturday. Yeo does have a knack, though, for quick turnarounds and beating the odds. And it’s worth repeating this: The Wild has only advanced past the first round of the playoffs three times in its existence, and Yeo was coaching two of those teams. *The Vikings feasted on the Lions last decade, going 18-2 against Detroit in the seasons from 2000-2009. This decade, though, has been a much different story. The Vikings are just 7-9 against Detroit since the start of the 2010 season, and their fortunes have tended to ebb and flow with their performances against Detroit. In the Vikings’ three playoff seasons this decade (2012, 2015 and 2017), they’re a combined 5-1 against Detroit. In the other years, they’re just 2-8 — and sweeps by the Lions have ruined multiple seasons, the most notable of which was 2016. With the NFC North as crowded as ever and the Vikings facing the Lions twice in the second half of the season — the first coming Sunday at U.S. Bank Stadium — the outcomes vs. Detroit could once again tell the story of Minnesota’s season. *If you thought nobody could have predicted Derrick Rose would score 50 points against the Jazz on Wednesday, you would be wrong. Someone actually did predict it on Twitter.